We are more than a local SEO firm. Our focus is growing our client's business by optimizing local search results, Facebook ads management and deploying ecommerce solutions at affordable prices. Local SEO is the single most important type of marketing for any business. An effective local SEO strategy will have invaluable and lasting results with very little ongoing cost. Here at the Vixil Group, we have helped other businesses achieve dramatic search results that increase business and encourage positive online engagement. Local SEO increases your online presence and visibility within your geographic region. Think of the last time you wanted to find a coffee shop. 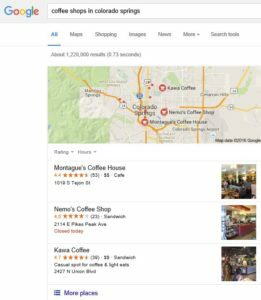 Chances are you searched “coffee shops near me” using Yahoo, Bing or Google and were presented with a list of local businesses offering the goods and services. Have you ever wondered why or how some business rank better in local search results? Most likely, the top ranked businesses either stumbled upon some great SEO practices or they hired a knowledgeable experts, like the Vixil Group, to devise a comprehensive strategy to optimize local search results. There are many ways to advertise your business, but by far the most important and cost effective way to advertise your business is optimizing how your business shows up in local search results. Today’s consumer are far more likely to search for a local business using the internet than ever before. Long gone are the days of searching for business using the Yellow Pages or any other printed media. If your business is not optimized for search or listed on sites such as Yelp, you are jeopardizing the long term viability of your business and missing out on a tremendous opportunity. At the Vixil Group, we understand the value of local search and the long-term benefits they afford to your business. We are experts at creating a comprehensive strategy to maximize your local search results against your competitors. We also offer a low cost, flat fee service for Local SEO to get your business on the right track. Want to learn more about how we can help your business launch a successful online marketing strategy? Simply fill out the form below to get started. Vixil Group is a boutique agency that helps small and medium business grow their online presence through SEO, improving local search results and social media engagement. We also specialize in eCommerce and general business consulting.